Borchert Field: Big Sale at Ebbets Field Flannels! Ebbets Field Flannels just announced a huge sale on their in-stock flannel jerseys. Their items are usually made to order, but once in a while they find themselves with leftover stock, either returns or samples made for product photos. They're selling these few jerseys at half-off. One of those jerseys is the 1936 Milwaukee Brewers road. The Brews won their third American Association pennant that season. 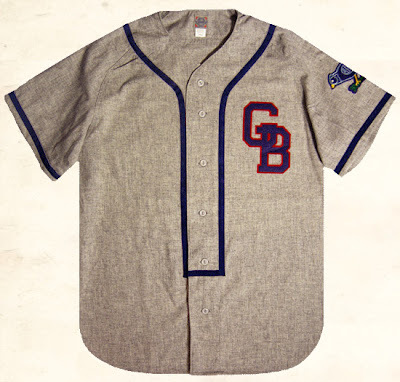 Also available is the 1953 Green Bay Bluejays jersey, from the former Milwaukee Brewers' farm club. Sizes are very limited, so head on over there now - you'll never see a lower price on these gorgeous jerseys.